Top 5 Best Primer for Acne of 2019: Do NOT Buy Before Reading This! Very few people are lucky enough to have a flawless complexion but that doesn’t mean that we can’t look our best every day. Today's modern women can take advantage of the extensive research carried out by the cosmetic houses over the years and select the best primer for acne. Put your best face forward. Regain your confidence with flawless skin and makeup that looks perfect all day. 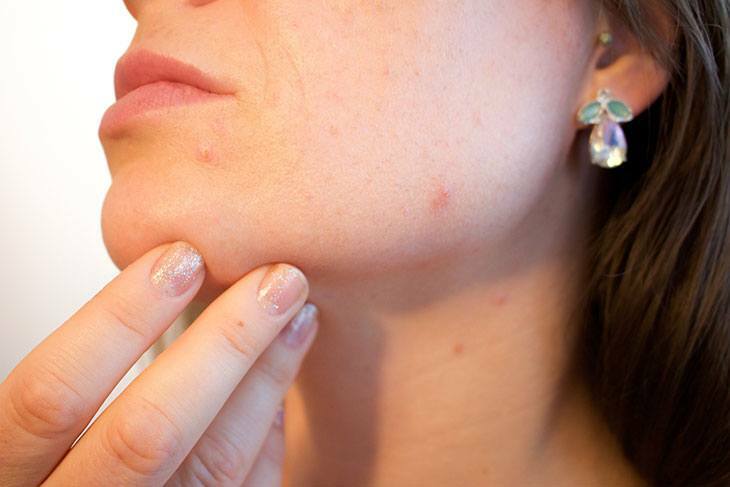 What is the Cause of Acne Prone Skin? So, What Should You Look for in a Primer? If you have acne prone skin or pitted scars as a result of acne you are not alone. According to the American Academy of Dermatology between thirty and forty million Americans (1) will suffer from acne at some stage in their lives. Acne usually occurs at adolescence but it may continue into adulthood, and it often leaves scars and redness that can have a negative impact on your self-confidence. Up to seventy-five percent of people between the ages of eleven and thirty are affected by acne (2). Acne is a problem that is brought about by oily skin. 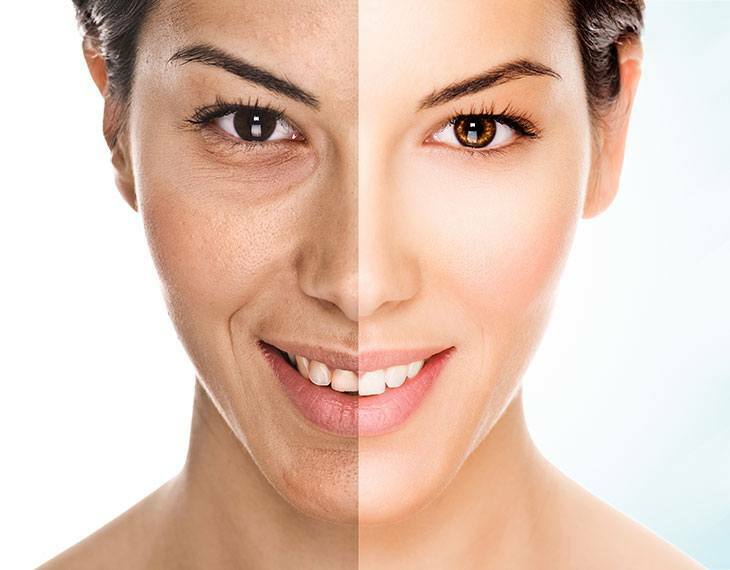 Oily skin is primarily inherited and not the result of diet or lifestyle. Breakouts are caused by the accumulation of sebum and old skin cells in the pores which then become infected by bacteria. Controlling the accumulation of sebum without drying out the skin is essential to the control of acne. Many people have never used a primer so they have not experienced the benefits that these products can offer. Primers are particularly useful for perfecting skin that is oily, whether on the entire face or just the T section. They form a barrier between the skin and makeup, and many of them hide the craters and marks left by acne. The benefits of a good primer are immediately visible. Primers form a base onto which you can put your foundation. It creates a matt surface, removing excess oil that reduces the longevity of your makeup ensuring that it stays in place all day. You can also forgo the makeup and wear it alone. A primer will give your skin a silky finish, smoothing out lines and minimizing large pores which tend to make the skin look rough and older than it should. It also helps to reduce the shine caused by excess oil on the skin. The best make-up primer for acne should be non-comedogenic (3), meaning that it has been developed to prevent blocked pores. These are usually oil-free formulations. Many primers contain Dimethicone, a silicone, which makes the product thick enough to smooth out holes and bumps. Always check the ingredients in the primer as sensitive skins may react negatively to Dimethicone. If in doubt do a patch test prior to using any new cosmetic. What you should look for in a primer must be based on the personal requirements of your skin. It goes without saying therefore that you should understand the ingredients that make up the primer and what they do before purchasing the product. Below are some of the components commonly found in primers. Antioxidants (4) – vitamins A, C and E help to reduce inflammation and will help it to look smooth and clear. Aloe Vera, Tea Tree Oil and Chamomile are known for their soothing qualities. Silicone-based primers – are thicker and help to smooth out the bumpy appearance that can result from acne, but these must be used with care as they can irritate sensitive skin. Fragrance-free – sensitive skins can react to fragrances, so it is best to avoid them. Color correction – although many primers are transparent, if your skin has a red appearance you will benefit from the addition of color in the primer you use. A green tint is used to counteract the red. Pore minimizing ingredients – if you have acne you probably also have large pores. A primer can help to reduce the appearance of large pores, giving the skin a smooth, youthful appearance. Water-based primers – these primers are lighter and mix more readily with the foundation. Salicylic acid or benzoyl peroxide (5) – These are the active ingredients in acne treatments. Primers containing these ingredients inhibit outbreaks. If you are using the primer without foundation, you may want to purchase a product with SPF. Start with your usual skin cleansing routine. Apply the primer onto clean and moisturized skin. These products go a long way, and you do not need to apply much. Use an amount not much larger than a pea. Apply the primer from the center of your face and work outwards. Allow the primer to set. Apply concealer by drawing a cross through any blemishes and gently melding it into the skin for a flawless finish. Always cleanse the skin before retiring for the night. A good primer should hide skin imperfections such as age spots, pitted scars and craters. 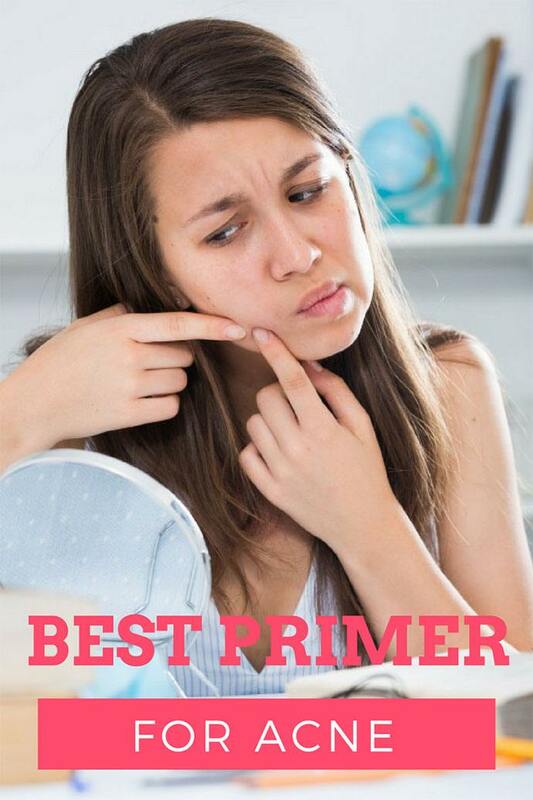 People with oily or acne prone skin will benefit the most from a primer. It should diminish fine lines making them less visible-It should make the pores look less prominent. It should help makeup to stay in place all day regardless of the ambient temperature. This waterproof primer contains antioxidants and vitamins A, C, and E, all of which help to keep your skin young and vital. The product gently moisturizes the skin without creating excess oils that can clog the pores. Suitable for all skin types, it will help to reduce excess oil as well as clearing dry and flaky spots. This product not only covers fine lines but helps to prevent the formation of new lines. Premium makeup primer contains Dimethicone which reduces the appearance of fine lines and covers up scarring. It also reduces redness. It is made in the United States and is fragrance, cruelty, and paraben free. The supplier will refund your money if you are not 100% satisfied with it. If acne has left you with a red complexion, this is the product for you. Designed specifically to combat redness, it has a green tint that neutralizes red tones in the skin. It sets your makeup, keeping it firmly in place for hours and inhibits the buildup of oily residues on the skin. It leaves a smooth and even finish, cutting the shine and making the pores look more refined. Large pores tend to have a rough and aging effect, so combatting the problem will leave you looking younger and more radiant. The product contains no irritants. It has vitamins A and E and other antioxidants that will help your skin to overcome the ravages of environmental pollution. This colorless primer not only reduces oil and the appearance of large pores but it actively fights off the reappearance of blemishes as it contains salicylic acid. Elf contains vitamin E and Tea Tree Oil, both of which have a soothing and healing effect on the skin. Your makeup will stay on all day even if you have excessively oily skin. Elf is inexpensive, but the pack is small, and you can't see through the opaque bottle, so you won’t know when you’re running out. It is cheap enough to buy two bottles so you don’t get caught without. Bare Minerals foundation primer perfects and prepares skin for the flawless application of foundation. It deals with the problems associated with dry and flaky skin as well as rough skin, oily patches, and large pores. It reduces the oily residue on the surface of the skin that causes makeup to wipe off and blur. The product contains antioxidants, plant extracts and vitamins C and E, which help to protect the skin from damage caused by pollutants. It is gentle on the skin as it contains no preservatives that can cause irritation. This product is a silicone primer and contains Dimethicone. While silicone primers are ideal for covering scarred skin, use them with caution as some people do not tolerate them well. Do a patch test before using the silicone primer, and you should be safe. The primer is a clear gel so it is suitable for all skin colors and can be used for oily and dry skin. It is light and fluid, some would say too liquid. Easy to apply, the bottle has a pump which dispenses the small amount that you require to keep your makeup in place all day. To use it you take a pea size knob into your hands and warm it to soften for easy application. This product is not a lotion, and it should be patted on in small bits and not rubbed in. The secret to successfully applying Becca is to use less - too much, and you'll have white patches and streaks on your face. Any excess primer should be wiped off to prevent streaks. Wait a few minutes for it to dry before applying foundation. For sheer value for money and versatility Premium Foundation Primer takes number one position as the best primer for acne prone skins. It is reasonably priced and is so gentle that it can be used on all skin types including sensitive skins. It not only fills in fine lines but helps to prevent new lines from appearing. It is waterproof, paraben free and non-greasy. If you are not happy with the product you have the assurance of the 100% moneyback guarantee. If you are not yet using primer, you don’t know what you are missing. Look forward to a brighter, younger looking future with makeup that looks good all-day long. Primer will give your face a soft velvety finish with fewer lines and zero shine. Please feel free to add your comments or share with your friends so they too can enjoy the benefits of great looking skin.